So writes Robert F. Kennedy Jr. in his new book “Crimes Against Nature,” which details how President Bush has rewritten the nation’s environmental laws in favor of industry and filled his administration with former lobbyists and corporate executives who now oversee the regulation of their former industries. A senior attorney with the Natural Resources Defense Council and president of the grassroots Waterkeeper Alliance, Kennedy argues that the Bush administration consistently favored corporate interests over the environment and public health, assaulting the very idea of a common good. He recently spoke with MotherJones.com George W. Bush’s many crimes against nature. MotherJones.com: How has the U.S. government historically changed its approach to public “commons” such as the air and water? Robert F. Kennedy Jr.: One of the successes of the right-wing propaganda campaign has been to convince the American people that the environmental laws were new innovations passed after Earth Day. But in fact, it’s always been illegal to pollute. The pollution was restricted by two ancient doctrines. One’s called the Public Trust Doctrine, which says that those assets that are by their nature shared assets — the commonwealth, the air and water, the wildlife, public lands — are owned by the public. Everybody has a right to use them, and nobody has a right to treat them in a way that will diminish their use and enjoyment by others. The other law is Nuisance Law, which protects private property from intrusion by polluters. Nuisance law has been turned on its head by the right wing, who claim to be on the side of property rights, but really only favor property rights when they’re talking about the right of a polluter to use his property to destroy his neighbor’s property or the public property. The law in the United States, in every jurisdiction until about 1876, was that if a factory put smoke into the air, even one day a year, and it got onto a neighbor’s property, the neighbor had the right to enjoin to close down the factory, and the courts had no choice but to do that. Those strong, ancient laws were dismantled through corruption and the political power of industry, as well as a general recognition that industrialization would be beneficial to the American public. But the pendulum swung too far, and by the early 1960s the polluters had basically displaced the public out of public trust assets. Then you had the reaction; you had Rachel Carson’s book “Silent Spring,” which was the clarion call, and then you had Earth Day, 1970, when 20 million Americans came out onto the street to demand the return of their ancient environmental rights. The result of that was the passage of 28 major environmental laws over the next decade that made an effort to restore those rights to the public. MJ.com: From there, what tactics did industry use to regain its position? RFK: The “Gang of Five” foundations that are huge repositories of industrial polluter money [the John.M Olin Foundation, the Sarah Scaife Foundation, the Castle Rock Foundation, the Charles G. Koch Charitable Foundation, and the Bradley Foundation] have been used to create think tanks, to recruit phony scientists that we call “biostitutes” and to fund politicians in order to undermine and subvert those environmental laws that were passed after Earth Day: the Endangered Species Act, the Clean Water Act, the Clean Air Act. Industry was kind of caught off-guard by Earth Day and the legislative barrage that followed. But since then, they’ve mobilized to regain control of the public trust assets. And really, the best measure of how a democracy is functioning is how it allocates the goods of the land, the public trust assets. Does it maintain the air and water under control of the people for the benefit of the public, or does it allow those assets to be privatized by politically powerful entities? MJ.com: How surprising has George Bush’s environmental policy been in light of his track record as governor? RFK: We weren’t surprised by the federal environmental record, because we saw that he’d been the worst environmental governor in America. Under his leadership, Texas became the most polluted state in the country, with the highest levels of air pollution, the highest levels of water pollution, and the highest level of toxic waste and toxic releases. And it was 49th among 50 states in per-capita environmental spending. He was only worsted by Gov. Mike Leavitt of Utah, who he has named his EPA administrator and who is now in charge of stewarding all of America’s environmental assets. MJ.com: And yet, as a candidate in 2000, he talked about regulating emissions and combating global warming. RFK: The problem for the president is that the environment and our environmental laws are very popular with both Republicans and Democrats among the rank-and-file. So, from the beginning, he’s had to conceal his radical anti-environmental agenda from the American public. He did it on the campaign trail by simply saying that he was going to support initiatives to control global warming. But once he got into office, he immediately reversed that and abandoned that promise, and began dismantling our environmental infrastructure. In keeping with that, his attack has been a stealth attack. They use Orwellian rhetoric to conceal this extreme agenda from the public. When they want to destroy the forests, they call it the Healthy Forest Act; when they want to destroy the air, they call it the Clear Skies bill. Most insidiously, as part of this stealth attack, they’ve put polluters in charge of the agencies that are supposed to protect Americans from pollution. The head of the Forest Service is Mark Rey, probably the most rapacious timber industry lobbyist in American history. The head of public lands is Steven Griles, a mining industry lobbyist who believes public lands are unconstitutional. The head of the air division of the EPA was Marianne Horinko, whose former job had been advising corporate polluters on how to evade Superfund. The second in command of EPA was a Monsanto lobbyist. If you look at virtually all of the sub-secretariats and agency heads in the Departments of Agriculture, Energy and Interior and EPA, the same pattern holds. Polluters have been put in charge of the agencies that are supposed to protect Americans from pollution. As I show in my book, these individuals have not entered government service for the public interest, but rather to subvert the very laws they’re now charged with enforcing. MJ.com: One lesser-known example of that pattern is John Graham at the Office of Information and Regulatory Affairs. What role does he play? 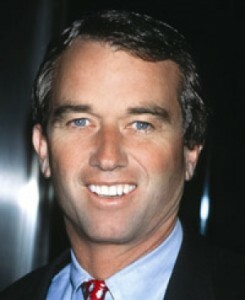 RFK: He’s been an anti-environmental activist for many, many years. He founded an anti-environmental think tank at Harvard, which is funded by polluting industries that pay Graham to produce reports [essentially] defending their corporate profits. He’s developed these phony algorithms that always end in the same result, which is that industry wins and the public loses. He runs the most powerful agency in the government today, which is the OIRA, part of the Office of Management and Budget. It’s a secretive agency inside the White House that is not subject to many of the laws that require open government. The other agencies that are charged with protecting the American environment from time to time develop new regulations in keeping with that mission. Usually it takes about eight years for a regulation to go through the regulatory process, which involves a lot of public debate, public notice and comment, hearings and review by attorneys and scientists. At the end of this painstaking and extremely democratic process, those regulations now disappear into a black hole at OIRA, which is supposed to review the regulations prior to passage. And at OIRA, the industry meets privately with John Graham and rewrites the regulations in private. When the regulations come out of his office, generally they are no longer designed to protect the public, but rather to protect industry prerogatives and profits. MJ.com: What’s the worst example of how that collaboration between industry and government has played out? RFK: One of the worst examples is the rewriting of New Source Review. I have three sons with asthma; one out of every four black kids in New York City now has asthma. Asthma attacks are triggered primarily by ozone and particulates, and the major sources of those materials in our atmosphere are 1,100 coal-burning power plants that are burning coal illegally. The Clinton administration had initiated investigations and prosecutions against 70 of the worst of those. But this is an industry that donated $48 million to President Bush and the Republican Party in the 2000 cycle and has given $58 million since. One of the first things that Bush did when he came into office was to order the Justice Department to drop those lawsuits. The Justice Department lawyer said that this had never happened before in American history, where a president accepts money from industries targeted for investigation and prosecution, and then orders the Justice Department to drop those investigations once he gets into office. There were 70 utilities involved here and, according to EPA, just the criminal exceedences from those 70 plants killed 5,500 Americans every year. Then the administration went and rewrote the Clean Air Act, gutting the New Source rule, which means those plants will be able to discharge ozone and particulates forever. MJ.com: How has the situation changed now that Michael O. Leavitt has replaced Christine Todd Whitman at the EPA? RFK: It went from bad to worse. Leavitt has giant social skills and charm, but his record is one of the most anti-environmental of any governor except for George W. Bush. The first thing that he did when he came into office was to dismantle President Clinton’s mercury rule. The same utilities that are discharging ozone and particulates, those same coal-burning power plants are also discharging huge amounts of mercury into our air, and the mercury ends up in the fish. Just a few weeks ago, the EPA announced its decision that, as a result of that, all fish in 19 states are now unsafe to eat because of mercury contamination. At least some of the fish in 48 states are now unsafe to eat. In fact, the only two states where they’re “safe” are Alaska and Wyoming, where the Republican-controlled legislatures refused to allocate the funds for their agencies to test the fish. Today, one out of every six American women has so much mercury in her womb that her children are at risk for a grim inventory of diseases, including autism, blindness, mental retardation and heart, liver and kidney disease. My own levels of mercury are so high — I had them tested recently — that a woman with the same levels would have a child with cognitive impairment. The Clinton administration had classified mercury as a hazardous pollutant under the Clean Air Act, which triggered a requirement that those utilities remove 90 percent of the mercury within three and a half years. It would have cost less than 1 percent of plant revenue, and the great thing about it is that it works; we now know that when the utilities stop discharging mercury, that the fish downstream clean up almost immediately. But this is an industry that gave all that money, over $100 million, to the president. A few months ago, the Bush administration announced that it was scrapping the Clinton-era regulations and substituting instead regulations that were written by utility lawyers, from the law firm of Latham and Watkins. Under the new rules, the utilities will effectively never have to clean up their mercury. And the chief lobbyist for Latham and Watkins was Jeffrey Holmstead, who is now the head of the air division of EPA. This is an example of how corporations have infiltrated our government and are dismantling it in order to privatize the commons. MJ.com: In “Crimes Against Nature” you explain how the administration has cut funding to laws already on the books, such as Superfund cleanup. RFK: Superfund has gone bankrupt. The Superfund itself, which was raised through a small tax on the chemical and oil industry, was used to clean up orphaned sites — sites where the responsible party could not be found. But more importantly, it was used to leverage recalcitrant polluters to clean up their own sites, because Superfund includes a triple-damages provision. That gives the EPA power, when a polluter drags its feet, to say to the polluter, “Okay, we’re going to clean up the site ourselves, and then we’re going to charge you triple.” And 90 percent of the Superfund sites that have been cleaned up in America have been cleaned up as a result of that threat. Without that threat, Superfund just becomes a welfare program for corporate lawyers, who can argue forever and ever about who’s responsible and what kind of cleanup should result. So today, with Superfund bankrupt, you’re not going to see many Superfund sites really cleaned up. And if they are cleaned up, it’ll be with taxpayer money, which is absurdly unjust. MJ.com: If John Kerry wins the election, to what extent can he undo the environmental damage this administration has done? RFK: Some of the damage can be patched up. Some of it is going to be irreparable, but for the rest it will need congressional help and cooperation. So a lot would depend on who controls Congress. At this point, Congress is controlled by anti-environmental Republicans like Tom DeLay. Tom DeLay is a former Houston bug killer who entered politics because he was angry that his extermination business had been impacted by the ban on DDT and other pesticides, and he’s out to destroy America’s environmental laws. MJ.com: What consequences do you see for the environment if Bush is re-elected? RFK: I can’t imagine! What he’s done already would have been unimaginable five years ago. He is the number-one threat to the global environment. And the disastrous impacts of this administration don’t just go to the environment, but also to our democracy. My book is really not just about the environment, but more about the excess of corporate power and the corrosive impacts of excessive corporate power on our democracy.